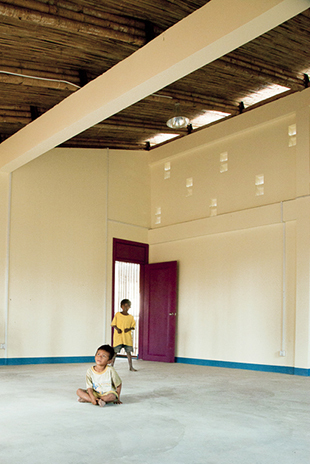 Construction of the youth center is a result of cooperation between Komitu Architects, a group of young Finnish architects and two Cambodian NGOs: Cambodian Volunteers for Society (CVS) and Khmer Kampuchea Krom Human Rights and Development Organisation (KKKHRDA) who work with the youth from Phnom Penh’s poor communities offering them possibilities for education, employment and societal participation. The youth center includes educational spaces as well as spaces for meetings, recreational activities and accommodation for poor students. The future users of the building and members of the surrounding community had an essential role in the design process. Working together with them through workshops ensured a building which is both functional and a symbol of their power and will to develop their society towards a better future. 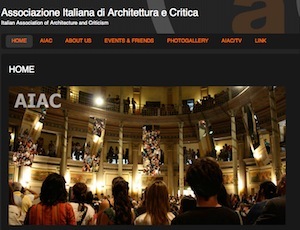 Also local students and professionals of architecture and engineering were engaged in the project through workshops, lectures and site visits. 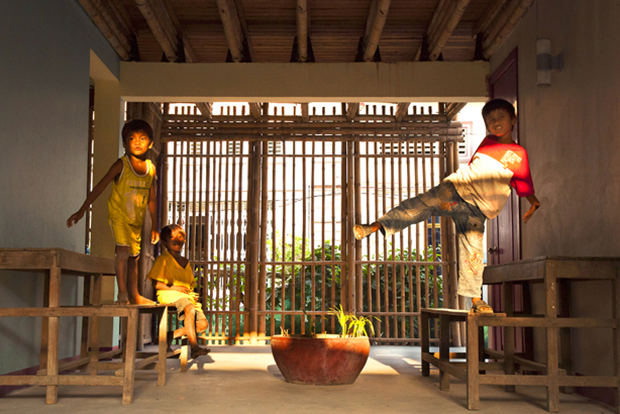 This led to one of the greatest achievements of the project as a local NGO (UPDF) realized a community center in bamboo and is organizing bamboo trainings for a network of community builders throughout Cambodia. 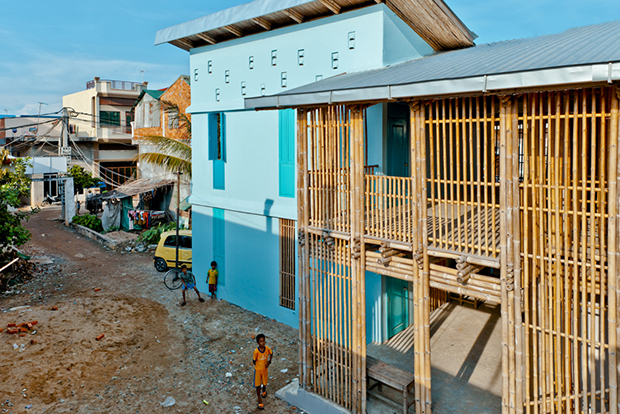 The main aspirations of the material choices and construction techniques used in the building have been sustainability and cultural understanding. 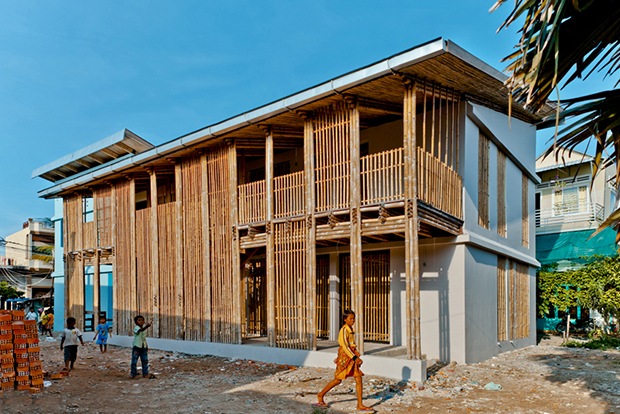 The main materials of the building are bamboo, compressed earth brick and recycled plastic bottles. 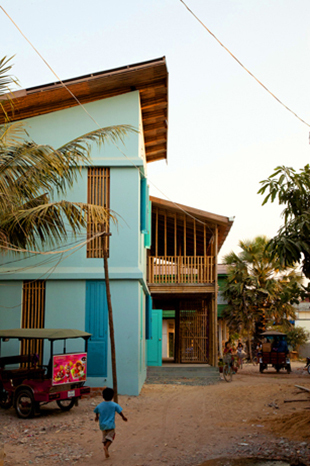 The main load bearing structure of the building is a concrete frame which is the most common building method in Phnom Penh. 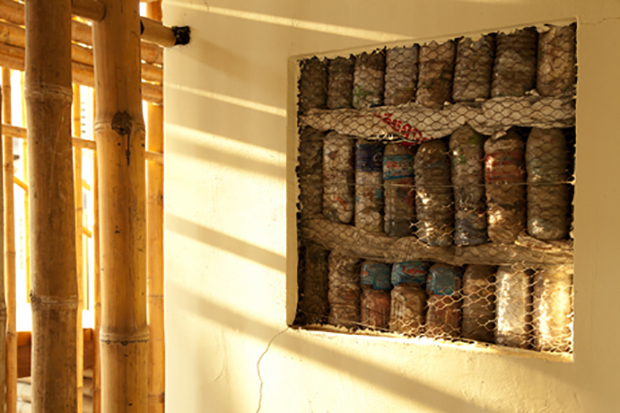 The frame is filled up with locally produced earth blocks. The carbon footprint of earth blocks is ten times smaller than of red bricks per mass. 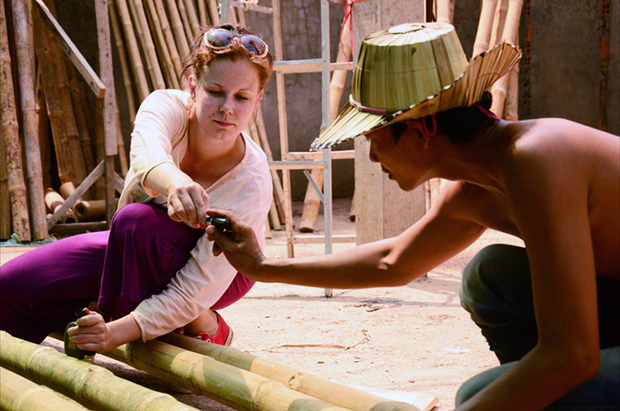 All bamboo parts are standardized and only hand tools have been used in their construction. Thus the building is easy to maintain and the techniques can be applied in future building projects of the local people. 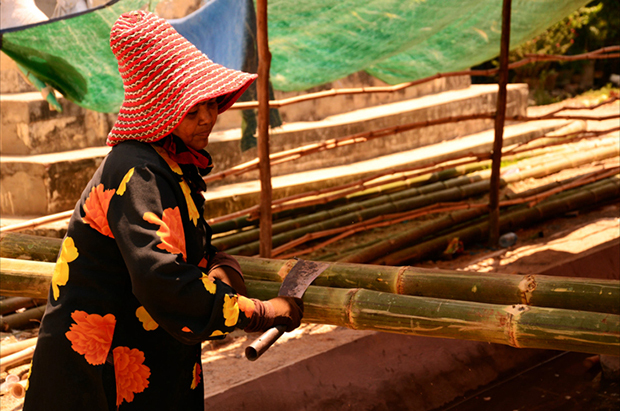 During the project an illustrated, khmer-language bamboo construction guide was produced. Rainwater will be harvested on site and the ground floor is raised against flooding. 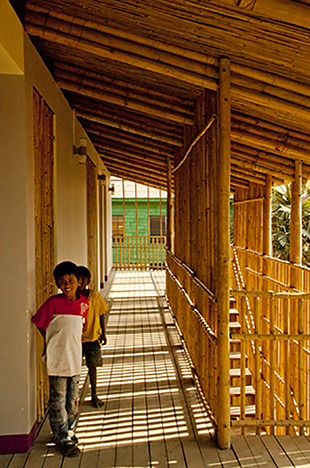 The main elements of the building’s architecture are the two solid objects and the ajoining light bamboo and wooden terrace. The terrace areas form the heart of the building and the focal point of all activities. The bamboo screens protect the terraces from excess heat while letting the light and air beautifully through making the terrace areas pleasant to linger in. Speeding up the air flow in through the shaded outdoor space and out through controlled ventilation holes creates natural ventilation which keeps the indoor temperatures and humidity low. The rhythm of the bamboo beams and columns, the oblique position of the building and the changing roof shape give the building its character. The youth center project begun in the spring 2010 in a design studio organized by the architecture department of Aalto University where an imaginary project was made. Komitu architects was founded the following summer by six friends, all still students at that time with the aim of realizing the project. 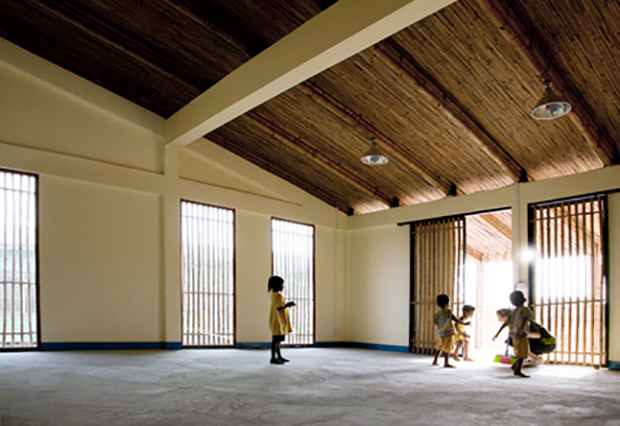 Komitu is part of a Finnish NGO Ukumbi who provide architectural services to people in need. Komitu is also part of a Nordic collaboration South of North. 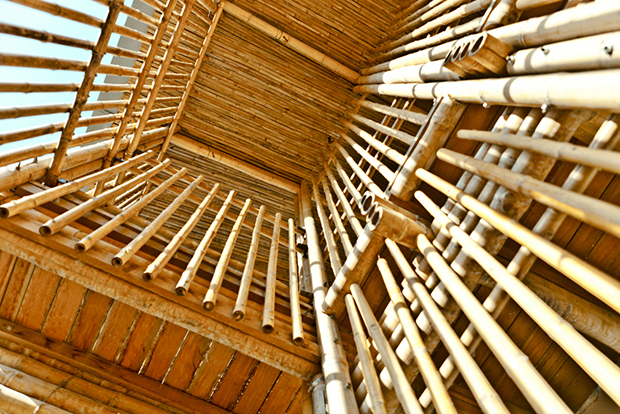 Structural consulting (bamboo structures): Kevin Rowell – Natural builders Co.